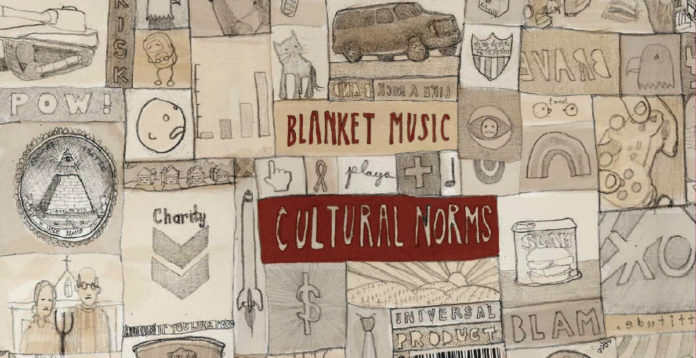 On the first track of Cultural Norms, Blanket Music does its best to strike fear into the hearts of music reviewers everywhere. In the bizarre story, the band sentences a critical naysayer to death “at the hands of our mild mannered bass player.” Cheeky lines like this, in addition to their vocal style, have earned this band many (many) comparisons to Belle and Sebastian; early Belle and Sebastian, when it was still about quaint stories and catchy folk pop. The resemblance really is uncanny, though. At times it sounds as though they have stolen Stuart Murdoch and forced him to sing on this album. Thankfully they don’t abuse this resemblance. There are no awkward schoolgirl lesbians on this album and they do not attempt at any point to assume Scottish accents. As the title suggests, the album deals with the norms of our country and our culture, with more than a touch of wit and irony. As a concept album, Cultural Norms works quite well. The problem with most concept albums is that they are far too grand in scale. The band will have some grandiose, overarching storyline in mind, but it falls flat when put into practice. Either the music suffers for the sake of the story (like parts of The Who’s Tommy), or the other way around (Pedro the Lion’s Winners Never Quit). Blanket Music instead works around a simple topic. It is more likely that they simply found themselves with a collection of songs that all fit within the same subject, rather than forcing themselves to write in a particular frame. This is reflected in the smooth, unforced nature of the songs. Each song can stand easily on its own, telling a self contained story or ruminating on cultural quirks. We hear from a general manager in “Keep the Prices Down,” a modern-thinking couple contemplating marriage in “Just Us,” and even a household cat (used as more of a metaphor for America, really) in “Cats Corps,” among other characters. The band also turns their lens back on themselves with “Press Conference,” asking the listening public if they would still enjoy their music without an interesting message or story. The music is enjoyable on its own, but the wit of lead singer Chad Crouch’s lyrics adds so much more to the band. Without such interesting subjects, Blanket Music could run the risk of coming off as bad twee pop. But fear not, Crouch knows what he is doing, and on top of that, he’s good at it.